Lozowski in training with England in September. 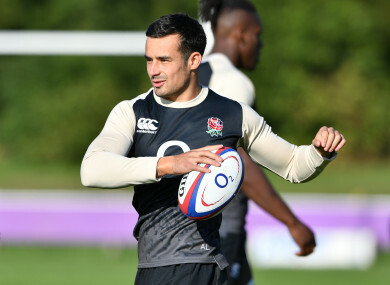 TWO WEEKS AFTER he was first cited, Saracens centre Alex Lozowski has been hit with a ban that will keep him out of England’s Tests against South Africa and New Zealand. The 25-year-old was cited for two offences in the wake of Saracens’ Heineken Champions Cup opening weekend win away to Glasgow Warriors, dangerous play in a ruck (Law 9.20) and dangerous tackling (9.13). Initially, the case against his dangerous tackle on Warriors’ Ruaridh Jackson was not upheld. But the England international was then found guilty of dangerous play during a 15th minute ruck, earning a two-week ban. After the terms of that suspension were tweaked to cover England’s opening two November Test matches, Lozowski appealed the decision of the independent disciplinary committee. The EPCR then made the unusual move of lodging their own appeal against the non-decision on the dangerous tackling offence. Both appeals were successful and so, yesterday, a new independent disciplinary committee convened to reappraise Lozowski’s 33rd minute tackle back on 14 October. The committee of Jean-Noel Couraud (France), Leon Lloyd (England) and chair Kathrine Mackie (Scotland) determined the offence to be worthy of a mid-range sanction and so handed Lozowski a six-week ban. Despite lodging a not guilty plea, the committee took account of a lack of aggravating factors and ‘some expression of remorse’ before reducing the ban by two weeks. The suspension was back-dated leaving Lozowski free to play again from 12 November, crucially, after England meet South Africa and New Zealand in Twickenham. He will be available to Eddie Jones for meetings with Japan and Australia, or alternatively for Saracens’ Premiership clashes with Sale and Leicester. Email “After weeks of appeals and counter appeals, Saracens centre Lozowski banned for All Blacks Test”. Feedback on “After weeks of appeals and counter appeals, Saracens centre Lozowski banned for All Blacks Test”.